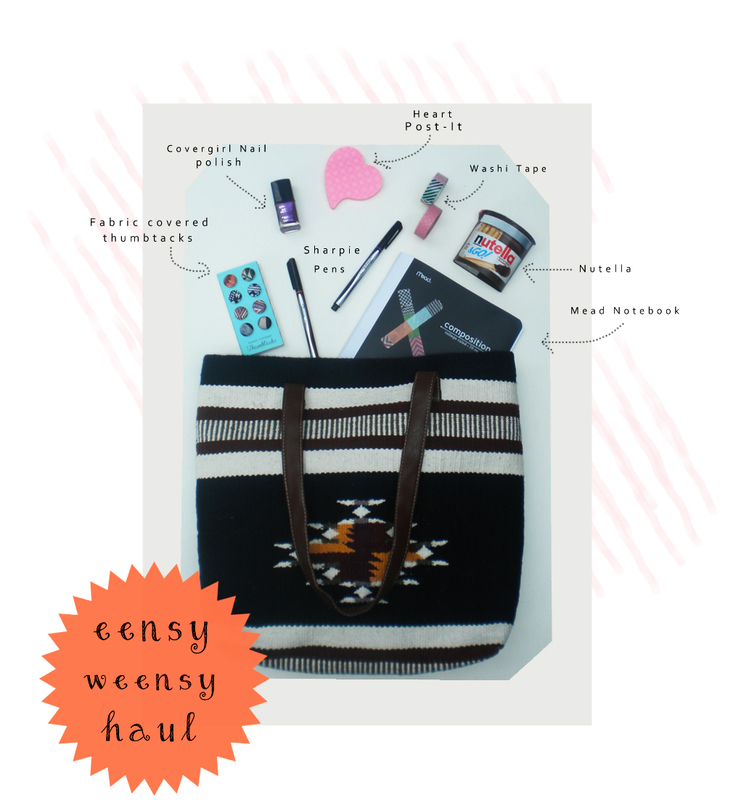 So Fashionably Frugal: Eensy Weensy Haul: The Tote Bag I chose! Eensy Weensy Haul: The Tote Bag I chose! I said I'd tell you what bag I'd choose this year for college! It took me a while because I ended up hating my first pick, which was the Feed for Target bag. I decided that I needed a tote bag because I tote so much art supplies around with me! Luckily, when I went recently to Target for school supplies I found the perfect bag! Here's everything I bought that day. I call it an eensy weensy haul because, well...compared to hauls I've seen on YouTube, this is nothing! But I got some fun stuff that I think is worth sharing with you!! 1) Aztec Woven Tote (Target $24.99)- Looks a lot more expensive than it is in my opinion. Beautiful colors and a fake leather handle. It seems to be very sturdy and easy to clean, which is a plus for me! 2) Fabric Covered Thumbtacks (Target)- They are too cute for words! & I got the last one! 4) Heart Post-Its (Staples)- I have a Post-It addiction like no other. I absolutely couldn't resist this one! 5)Washi Tape- Striped (Target), Pink (Wal-Mart)- Another addiction of mine. I like to put them on my school notebooks. They are a great way to add a unique touch to your things! 6) Nutella To Go- I'm a health nut, and this definitely isn't super healthy. But I heard it's delicious and I wanted to give it a try! Why not, right? 7)Mead Notebook- Target- Really small, cute and flexible. Being an art student, I don't take much notes. It's all about drawing. So, notebooks are barely needed. The Best Oversized Sweaters Under $60! Back to College : School Bags For Under $55!